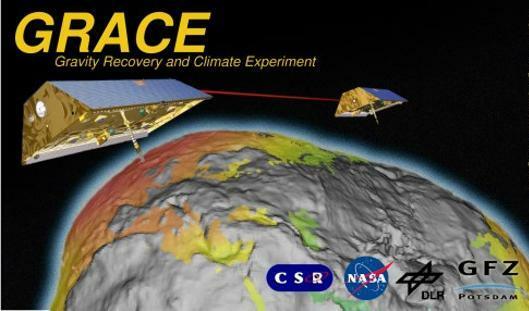 Launched 17 March 2002, t he Gravity Recovery and Climate Experiment (GRACE) twin satellites made detailed measurements of Earth's gravity field and improved investigations about Earth's water reservoirs, over land, ice and oceans. GRACE was a collaboration of the US and German space agencies (NASA and DLR). The key partners were the University of Texas Center for Space Research (CSR), the GeoForschungsZentrum (GFZ) Potsdam, and the Jet Propulsion Laboratory (JPL). GRACE measured gravity by relating it to the distance between the twin satellites. When there was an increase in gravity ahead of the pair, the front satellite sped up and the distance between the pair increased. When there was an increase in gravity between the pair their distance decreased. The opposite occurred when there was decreased gravity ahead of, or between the satellite pair. The satellites were separated by 220 km and could detect changes smaller than a micrometer per second in relative velocity. These measurements, in conjunction with other data and models, provided observations of terrestrial water storage changes, ice-mass variations, ocean bottom pressure changes and sea-level variations. GRACE ended its science mission in 12 October 2017. ACC – Super STAR Accelerometer is in both satellites and measures non-gravitational forces acting on the satellites, such as solar radiation pressure, air drag and attitude control activator operation. GPS – Black Jack Global Positioning System Receiver is used for navigation and collects atmospheric occultation data. SCA – Star Camera Assembly provides orientation references for both satellites. KBR – K-Band Ranging System uses K and Ka-band to measure the separation change between the two satellites. LRR – Laser Retro Reflector provides orbit verification from the terrestrial Laser tracking network. It is also used for precise orbit determination.